Posted on December 15, 2017 by Sara K.
In Part 1, I described the lakes where I camped. 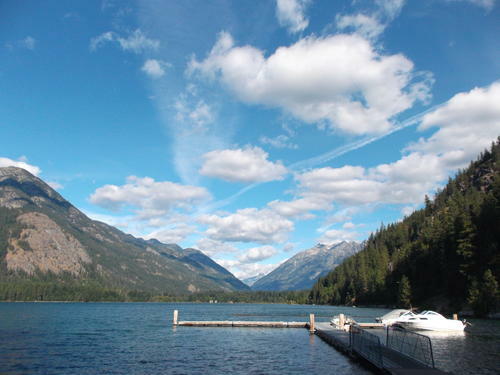 In this post, I am going to share lakes which were special to me even though I did not camp there. 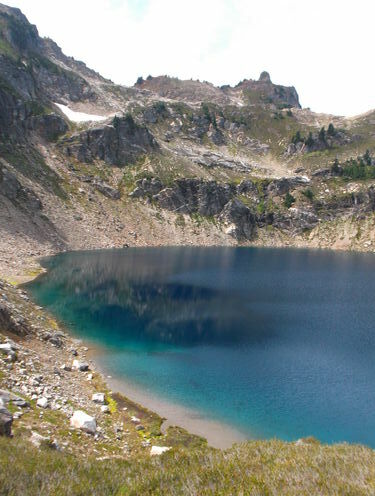 Blue Lake in the Indian Heaven Wilderness is special because a) it’s beautiful b) that’s where I did my water refill in Indian Heaven Wilderness and c) it’s beautiful. 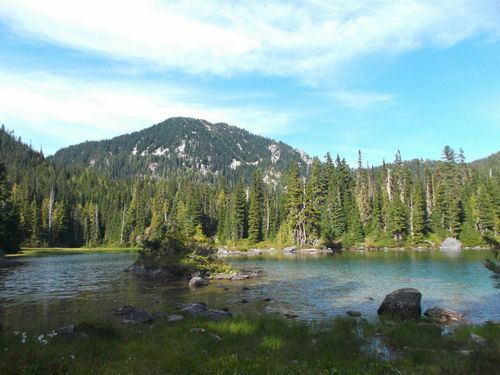 I had planned my hike so I would not stay overnight in Indian Heaven Wilderness (due to all of the mosquitoes) but if I were going to stay overnight in Indian Heaven, I’d try to claim one of the coveted campsites by Blue Lake. 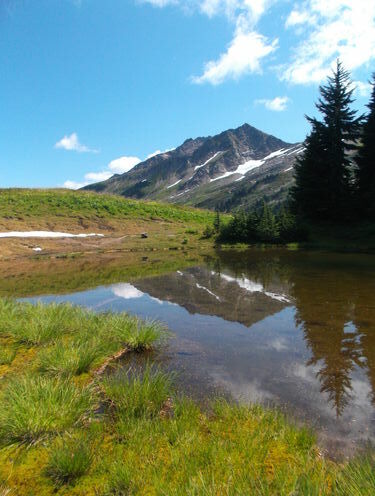 “Small Pond” at mile 2240.6 on the Halfmile maps, Mount Adams Wilderness, Southern Washington. 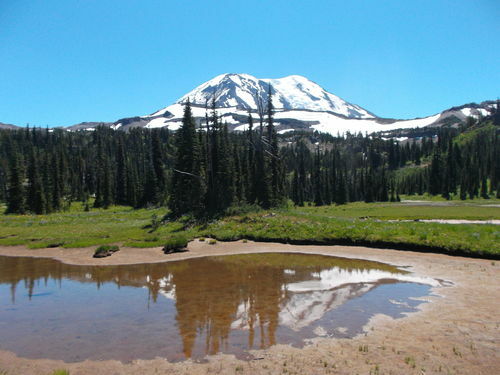 Okay, this is a ‘pond’ not a ‘lake’, but it allowed me to take a Shiretoko Lakes style photo of Mount Adams, so this ‘pond’ counts as a special lake for me. 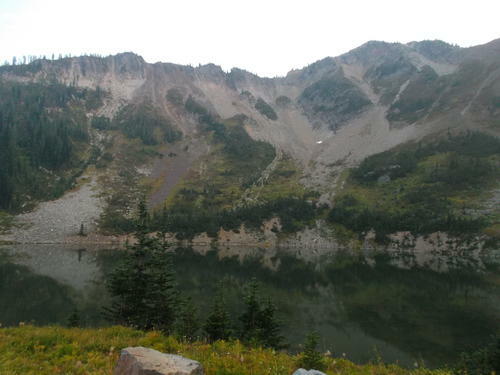 Sheep Lake, near Chinook Pass, Mount Ranier National Park, Southern Washington. 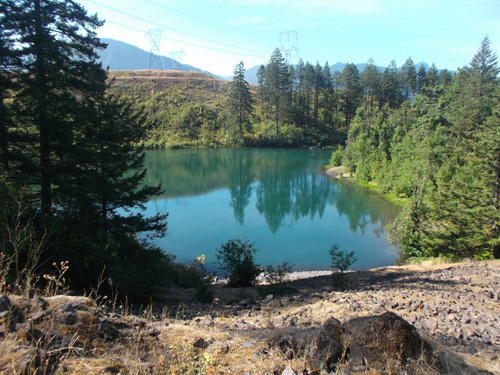 I know that Part 1 also has a photo of Sheep Lake, but it’s such a wonderful lake that I have to include it in this post too. It’s a great place to each lunch! Mirror Lake, near Snoqualmie Pass, Central Washington. 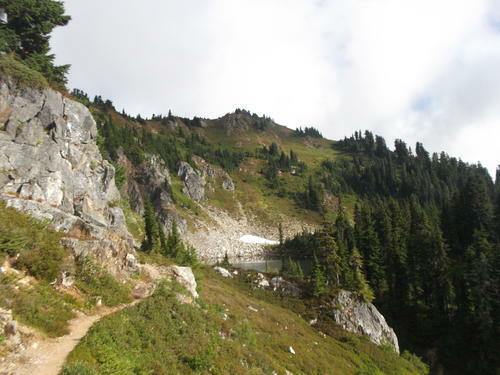 Like most hikers, I think the PCT between Tacoma Pass and Snoqualmie Pass ranges from okay to awful (actually, I did not think it was as terrible as some of the guidebooks claim it is, but I suspect that’s because there have been some improvements since those books were written). But then there is Mirror Lake! Coming from the south, I first saw the waterfall created by the lake outlet, and then I got high enough to see the lake itself. Wonderful! And to make a magical place even more magical, there was trail magic – I got to eat some fruit, a sports drink, and some snacks. Thanks, Trail Angel! Mirror Lake is an island of fantastic in a sea of ugghhh. 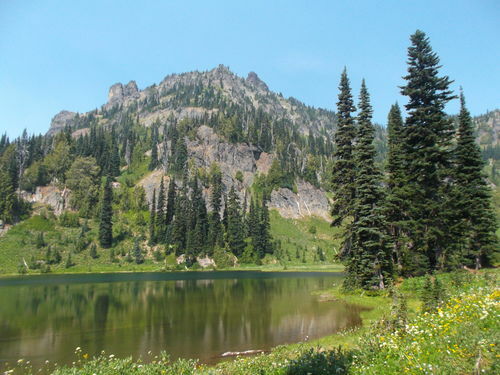 So, unless you want to complete the Washington PCT, my recommendation is to go straight to Mirror Lake (it’s only about an hour’s hike away from Ollalie Meadow, which has a road) and ignore the rest of the PCT between Tacoma Pass and Snoqualmie Pass. 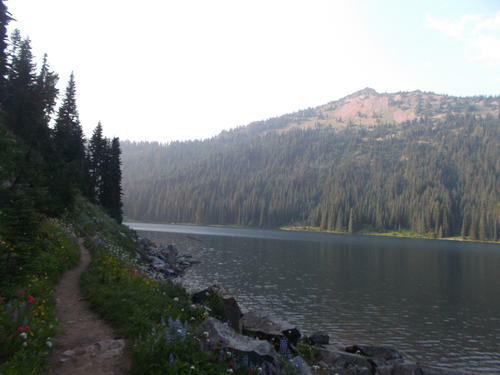 Spectacle Lake, Alpine Lakes Wilderness, Central Washington. Waptus Lake, Alpine Lakes Wilderness, Central Washington. Waptus Lake is a really big lake. I remember I took a break to dry out my gear (it had rained that morning) at a viewpoint where I spent a lot of time looking at this lake. 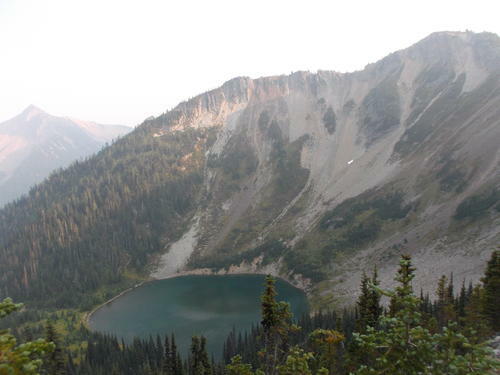 Deception Lakes, Alpine Lakes Wilderness, Central Washington. 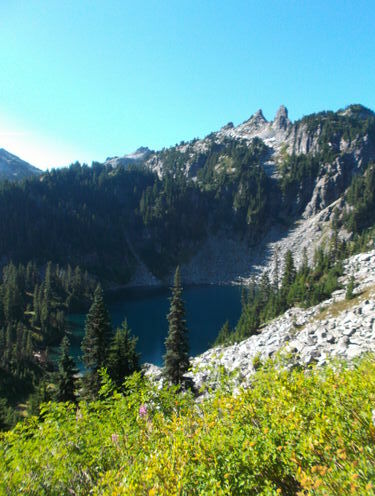 Deception Lakes was fantastic! (That is, it was a fantastic place to eat dinner and enjoy the scenery, I think I would have had problems if I camped there overnight). 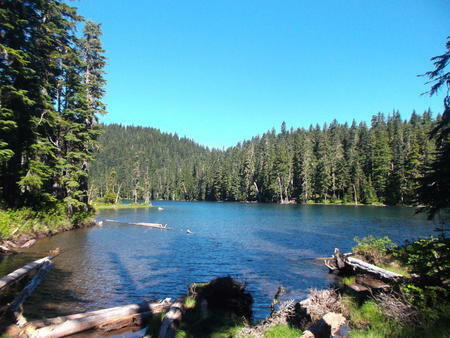 Just when I thought I couldn’t be more impressed by the lakes in Alpine Lakes Wilderness, I find these lakes which are beautiful in a *different* way from the other lakes I had seen. 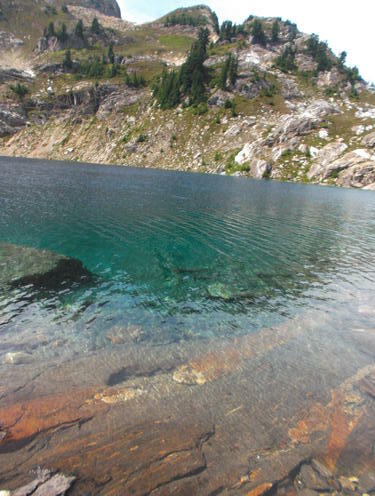 Trap Lake, Alpine Lakes Wilderness, Central Washington. 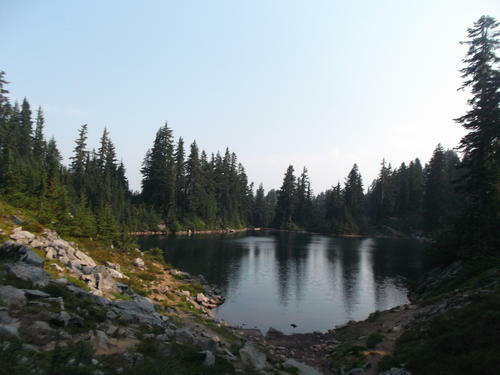 I don’t know why Trap Lake caught my eye compared to other lakes in the Alpine Lakes Wilderness. 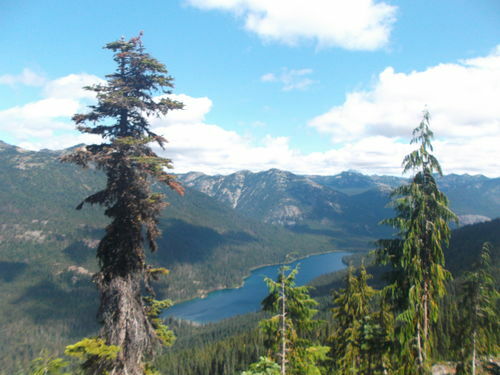 Maybe it’s special to me because it was my reward for ascending Trap Pass (the other reward was meeting some cool hikers who had camped at Trap Pass and had slept in that morning – I later met one of those hikers again at another lake, and then at Stevens Pass). Pear Lake is another one of those lakes which is the only water source for miles around it (and it’s also slightly off the PCT – I naively assumed there would be some place it would cross the PCT, but no, I had to backtrack to the side trail which leads to the lake). It’s a beautiful lake nonetheless, and worth visiting even if it wasn’t an important water source. And the water looked very clean and clear by the standards of sitting water. 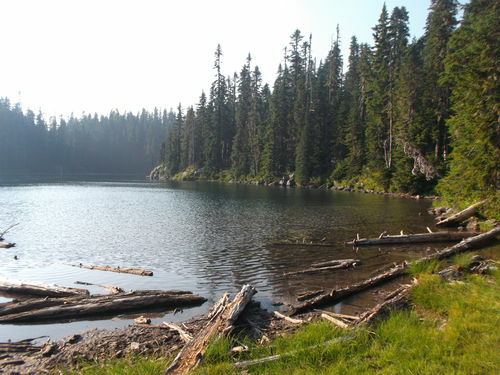 Lake Sally Ann, Henry M. Jackson Wilderness, Northern Washington. Lake Sally Ann is yet another beautiful lake. What I find special about Sally Ann (besides the local guy I met there) is the location. It’s on a mountain ridge where one doesn’t expect to see a lake, and while I was hiking up there I was wondering where the lake *could be*, and there it sits, improbably. Some guidebooks describe Reflection Pond as being ‘gross’ but I thought it was a really cool spot. Yes, I drank the water here. I thought the views were excellent, and there was shade too. 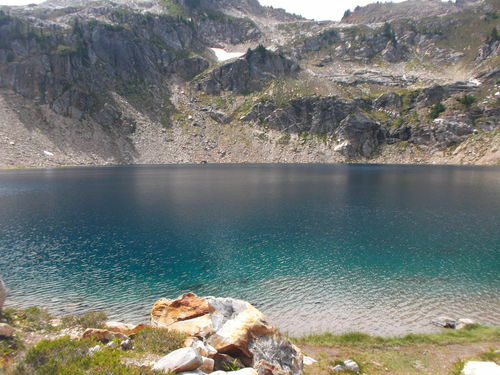 Last but NOT LEAST is Mica Lake. 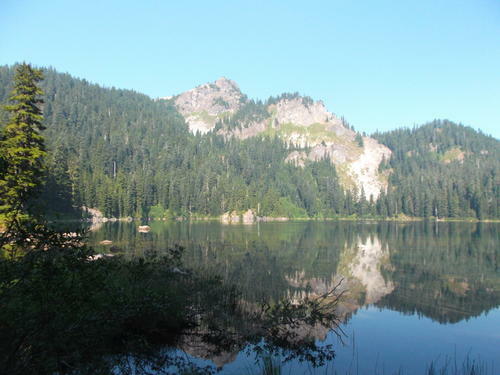 Mica Lake has the distinction of being my ~favorite~ lake on the entire Washington PCT. Mica Lake is an awesome place to hang out. I ate lunch and did some foot care there. I got water from the outlet (running water is usually better than standing water). 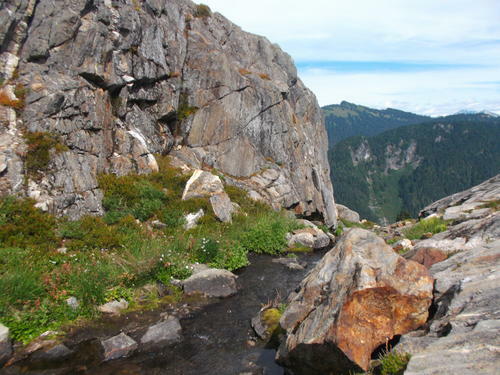 Outlet of Mica Lake, Glacier Peak Wilderness, Northern Washington. I noticed that someone had even built a little stone wall to offer a little wind protection for a campsite. 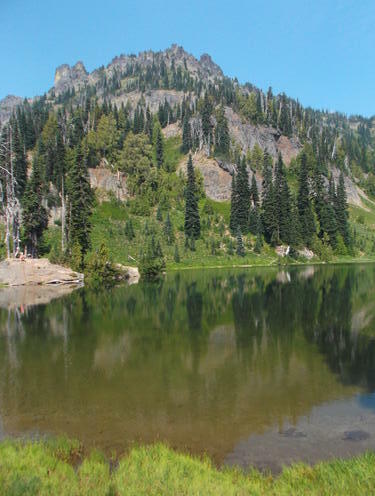 Though I’m sure the wall helps, and even though this IS my favorite lake in Washington, I do not recommend camping here – the condensation will be horrible (one hiker I met, Chatterbox, did camp here, and he confirmed that the condensation is horrible). 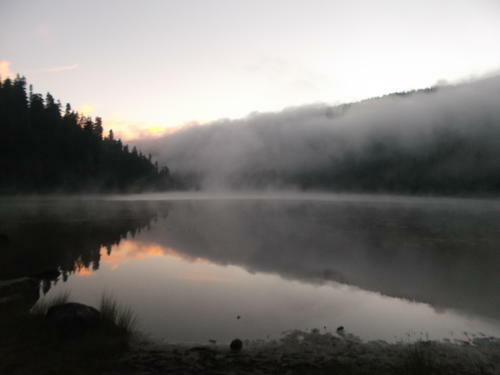 But if you don’t camp here, then condensation will not ruin your experience of this fantastic lake! 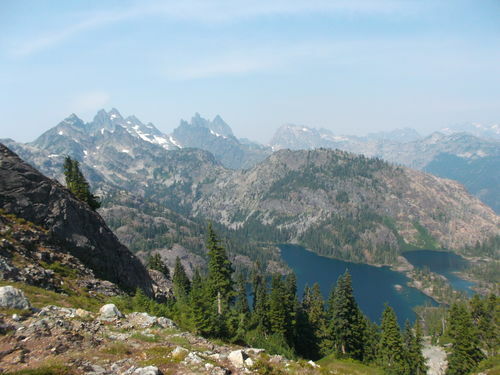 Mica Lake, Glacier Peak Wilderness, Northern Washington. 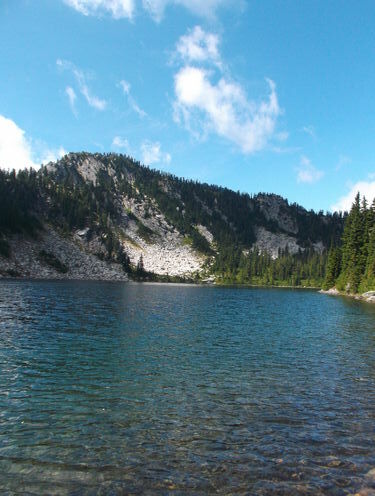 Since this is my favorite lake on the Washington PCT, it is the perfect lake to end this post.